The beginning of Steve Rogers’ career as Captain America has been significantly embellished over the years, as has that of his wartime partner, “Bucky” Barnes. In the original 1941 origin story, we jump from the end of the “Rebirth” to a panel asking, “Who is Captain America?” Cap, in uniform with his original triangular shield, is shown surrounded by newspaper headlines touting his early escapades (“Captain America Captures Spy Ring . . . Nabs Spy . . . Prevents Dam Explosion!”). 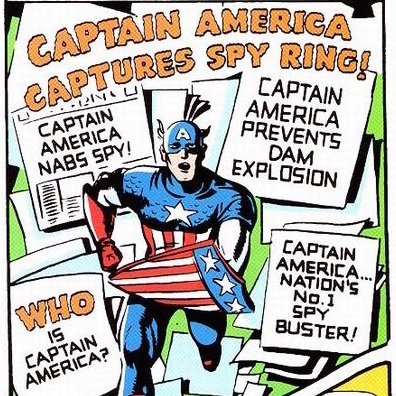 Since it would be nearly a year until the U.S. was actually involved in the war, Cap’s initial heroic activities involved thwarting domestic espionage and sabotage. Suddenly, we find ourselves at “Camp Lehigh of the U. S. Army,” where Private Steve Rogers (identified by name for the first time!) is shown being approached by camp mascot, “Bucky Barnes.” The two are apparently already acquainted, and Barnes holds a newspaper and calls out to Steve: “Look’t this . 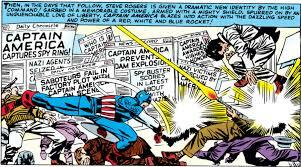 . . Captain America is at it again!” (also in ToS #63 & CA #109 & #215, but the camp is not identified). In CAC #1 Bucky seems to immediately discover Steve is Cap, leading to their partnership, but subsequent stories shed light on Steve’s activities in the weeks that follow his transformation (the Rogers/Barnes relationship—and its transformation over the years—will be discussed in more detail to follow). Cap’s first order of business: training. “Shortly after Dr. Erskine’s tragic death, Rogers was put into a special training program to teach him how to use his new body. For three months, he worked out with the greatest boxers, wrestlers, body builders, and gymnasts the free world had to offer!” (CA #255). Since he “would be the only one of his kind . . . Steve listened to his instructors well and trained his new body to the perfection the professor had made possible . . . and he prayed that one super-soldier could make a difference” (The Marvels Project #5, cover variant below by Steve McNiven). Then I pray that I’m equal to the task, General. This land of our may have seen some hard times, and maybe it hasn’t always lived up to the promise of the Founding Fathers . . . but America at its best has always stood for the rights of man, and against the rule of tyrants. And if America needs a man to stand for her principles, to battle the forces of tyranny—then, as God is my witness, I shall be that man! (CA # 255, CASL #7). Three nights later in rural Maryland, Cap stops an attempt to kidnap “a high ranking colonel.” The following night, he takes down “a major Nazi bund leaders” meeting in New York and stopped the attempted theft of new technology from the nearby Grumman aircraft plant. Two weeks later he disrupts a smuggling ring, and a week after that he’s in the American West thwarting an attempt to destroy Boulder Dam (all CA #255, nicely giving form to many of the newspaper headlines from earlier stories). Next up: Steve gets a partner, and a new shield! How much time passed between “Rebirth” and Rogers’ arrival at the camp is uncertain. The model for “Camp Lehigh” (located in New Jersey) where Steve and Bucky were to be based during their early careers, most likely was “Camp Kilmer” in New Jersey, named for Joyce Kilmer, the soldier-poet from nearby New Brunswick who was killed in World War I. Camp Kilmer served as the New York Port of Embarkation. It’s connection with the Amboy branch of the Lehigh Valley Railroad is the likely source of its fictional name here. AdvCA #1 also shows Rogers’ arrival at Camp Lehigh and a “pre-Cap” adventure breaking up a ring of smugglers. Rogers meets James Buchanan “Bucky” Barnes in issue #2, continues to fight smugglers, and receives his original uniform (modeled after drawings of a costumed here he’d created) and triangular shield. 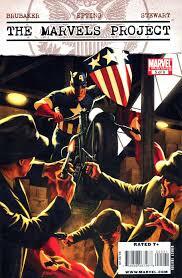 As CA, he battles three Nazi assassins are sent by the Red Skull to find the secrets behind Project Rebirth. According to another calendar depicted in CASL #7, it is now March 1941. The Marvels Project #5 show the Red Skull embarking on his own sadistic reign of terror in occupied France at the same time. The Red Skull character debuted in the second story in CAC #1 (with complications; more details to follow). Meanwhile, in Germany, one “professor Burstein” continues the Nazi quest for Erskine’s formula (his son, Noah, mentioned in passing, will later be responsible for Luke Cage’s transformation into Power Man!). MP #5. A short tale in CA Annual #13 (“Symbols,” Ron Marz, 1994) depicts the early discovery of Steve Rogers’ CA identity by an African-American soldier named “Biz” Duckett. Biz promises never to reveal the secret, and when “agents of a foreign power” try to beat the secret out of him, he’s rescued by Captain America (in original costume, with triangle shield). Rogers recalls the story decades later when he attends Duckett’s funeral. Black Panther vol 2 #30 (May 2001, Christopher Priest), which “reveals the never-before told fate of the original shield” (or at least one version of it!). This story was expanded in the 4-issue limited series, CA/BP Flags of Our Fathers (2010, Reginald Hudlin). In this telling, Baron Wolfgang Strucker and the Red Skull are directly involved; the “special forces” are Sgt. Fury the Howling Commandos, the Panther and his Wakandan warriors have already brutally dispatched a detachment of Nazis; Cap and the Howlers are captured and detained, but they ultimately work together with the Black Panther to defeat the Nazis. While fascinating on many counts, this retelling raises major continuity issues. Cap is not generally thought to have met Fury & the Howlers until well after this. This Panther knows Cap’s identity as Steve Rogers (and T’Chaka is shown as a boy). 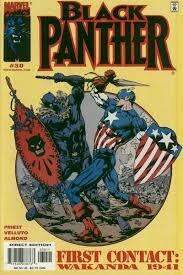 Cap asks the Panther to join the Invaders (the Invaders are not formed until late December, 1941). Master Man and Warrior Woman, notable villains from the Invaders series who don’t turn up until 1942, are not only present but are killed at the end of the story. This story addresses some interesting conflicts in the values and motives of Cap and the Black Panther and features Marvel’s first African-American character, Gabe Jones, as the narrator. It also depicts Cap’s triangular shield being destroyed and Cap using the Panther’s round shield as a substitute, and insinuates that this more powerful offensive tool inspired Cap’s new round shield. “Presentation,” by Joss Whedon, in CA #7 (March 2016). This is a prime example of shield confusion, since Cap could not have been in Europe with American troops early in 1941. 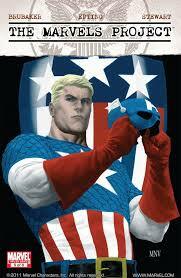 It seems that early in his career, Cap’s shield was something of a fluid commodity. While the triangular shield was gone by CAC #2, it still appears in occasional retro-continuity stories (like this one), the design varying in number of stars, stripes, and even shape. The new circular shield (which we’ll come to next), while always depicted in modern times (and in modern retconned stories set in WWII) as having red-white-red concentric stripes with white star on inner blue circle, was shown in many golden age stories as having an extra inner white circle-stripe or even an outer blue circle-stripe.